The Interlake Natural Area supports an incredible variety of wildlife. It boasts a 3,235,253-acre (1,309,260-hectare) mosaic of woodlands, expansive wetlands, unique karst features, lakeshores and native prairie. The size and relative intactness of the Interlake, its unique and varying landforms and its situation in the transition between the prairies and the northern boreal forest combine to produce a complement of species that are rarely observed together. Endangered tall grass prairie occurs here. Karst features supporting globally uncommon alvar habitat, internationally significant wetlands and beautiful beaches are also found here. Nestled between lakes Winnipeg and Manitoba, the health of the Interlake’s habitats, especially its sprawling wetlands and riparian (riverbank) areas, contributes to the health of these lakes. Five Important Bird Areas occur in the natural area. This includes the internationally significant Delta and Netley-Libau Coastal Marshes. Unique karst features are found with limestone geological formations. Overwintering dens that support the world’s greatest concentrations of snakes are also found here. In addition, inland cliff habitat supports endangered Gastony's cliffbrake. The Interlake encompasses the northernmost extent of tall grass prairie in North America. It is also the site of one of only two landscape-scale tall grass prairie remnants in Manitoba (the other being the Nature Conservancy of Canada’s (NCC's) Tall Grass Prairie Natural Area situated along the U.S. border). These prairies support several species at risk, including Dakota skipper, small white lady’s-slipper and false foxgloves. 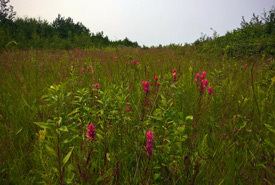 For more information about the Interlake and the conservation work NCC is undertaking in the region, see NCC’s Interlake Natural Area Conservation Plan.